My latest experience with LaGrange Toyota was I think the best car buying experience I’ve had. Wayne Pittman was my salesman. He and The LaGrange Toyota Team from the first contact on the lot through the financial department proved the most professional Team Work experience I’ve ever seen. They worked hard to insure my dream came through and at affordable budget. I can’t express my appreciation for the quick action to cut to the best deal and save time. LaGrange Toyota should be your next stop for your next car purchase!!!! Thanks, Wayne, Jason, Bentley, Shane and Mavorick! My latest experience with LaGrange Toyota was I think the best car buying experience I’ve had. Wayne Pittman was my salesman. He and The LaGrange Toyota Team from the first contact on the lot through the financial department proved the most professional Team Work experience I’ve ever seen. They worked hard to insure my dream came through and at affordable budget. I can’t express my appreciation for the quick action to cut to the best deal and save time. LaGrange Toyota should be your next stop for your next car purchase!!!! Thanks, Wayne, Jason, Bentley, Shane and Mavorick. Great customer service. This was my third 4Runner from this dealership. Had great service from my salesman Jim Hunt and Charlie Shirey. I have been satisfied every time. I even drive the 65 miles back to the dealership to have my car serviced. My latest experience with LaGrange Toyota was I think the best car buying experience I've had. Wayne Pittman was my salesman. He and The LaGrange Toyota Team from the first contact on the lot through the financial department proved the most professional Team Work experience I've ever seen. They worked hard to insure my dream came through and at affordable budget. I can't express my appreciation for the quick action to cut to the best deal and save time. LaGrange Toyota should be your next stop for your next car purchase!!!! Thanks, Wayne, Jason, Bentley, Shane and Mavorick. My latest experience with LaGrange Toyota was I think the best car buying experience I’ve had. Wayne Pittman was my salesman. He and The LaGrange Toyota Team from the first contact on the lot through the financial department proved the most professional Team Work experience I’ve ever seen. They worked hard to insure my dream came through and at affordable budget. I can’t express my appreciation for the quick action to cut to the best deal and save time. 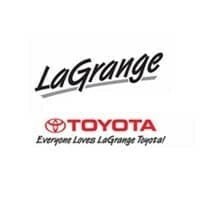 LaGrange Toyota should be your next stop for your next car purchase!!! !Thanks, Wayne, Jason, Bentley, Shane and Mavorick. Heather Brown is absolutely the BEST! She put us in a 2015 Kia Sorento, and I’m in love! She made us feel so welcomed at Lagrange Toyota. That’s my sis from another Miss! Thank you Heather Brown ❤️❤️❤️❤️❤️ I would recommend her in a heart beat. If you think it can’t be done, leave it in her hands and a dream will come true! These guys were very respectful and nice. Help me pick what truck I wanted to buy. And a big thanks to Steven Adamson. Great sale sales guy! My Review of LaGrange Toyota Amulkey34 4/09/2019 Reason For Visit Sales (Used) "Best dealership around!!" Wanda Norris was a fantastic salesman(lady). She made sure I had the car and the price I wanted! She took the time to understand all our needs and made us feel like family. If you want a great salesman for your next purchase, choose Wanda Norris!